Inspired by the series on Tactical Asset Allocation by Michael Stokes, I have run some tests to include Gold (GLD) as an extra asset-class in the strategy. This brings the selected ETFs to a total of 7: EEM, EFA, GSG, IEF, SPY, VNQ, GLD. The code of the original model has not changed. Below is a table comparing statistics of the 2 versions for the period 1-1-2003 / 20-10-2010. Adding Gold does improve the results slightly and consequently I will include GLD in the strategy as of tomorrow. An updated performance report and equity curve is published at the strategy 1 – details page. Are you using AmiBroker for your WTAA system? If yes, are you using rotational mode with position scoring or did you write custom code? Reading the MarketSci blog, it sounds like a TAA system could be created with AB’s rotational mode, and a max open positions setting of 4 (which I think was Michael’s max positions out of his 7). The position sizing of these 4 vehicles seems to be a bit more challenging. What is your approach to sizing? Hi Dave, I am not using rotational mode, rather a programmed exit at the end of the week. The AB ranking positionscore mechanism is used to select the top performing ETF according to the logic discussed in the system description. I have seen the MarketSci blog and Michael’s take on position sizing. He decided not to share the nuts & bolts of the calculation so it is up to the reader to come up with his/her own version. My version in the WTAA system is fixed position sizing, not the best choice I admit. However never found the time to further investigate. Hi QD – great website. Sorry for being dim, but what is the DVR statistic you quote and could you provide and calculation example of it please? Some sort of adjusted Sharpe? The DVR statistic has been developed by David Varadi at CSS analytics. 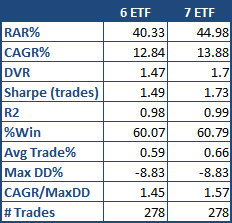 DVR equals sharpe ratio times R^2.